As we head into cooler nights but still relatively warm days, I’m left with a dilemma — just when do I put away my flip flops and hunt for my coats and sweaters, the latter of which is currently piled in boxes in a storage unit of my condo complex. Twice annually, I transition from my “summer” closet to my “winter” one, using the opportunity to re-evaluate my wardrobe. It’s a good exercise, letting me take a realistic look at everything from my waistline (it’s always sad when pants no longer fit) to my style (did I really wear those studded boots all last winter??). The benefits are also charitable — I subscribe to the ‘if you haven’t worn it since last year, give it away’ mantra, and also tend to recycle clothing that no longer fits. At 30, I’ve given up on fitting into my college jeans, and even if I could, I doubt the ‘jewels on the back pocket’ designer look is still in style. But just because I’ve given away several items doesn’t mean I can fill those suddenly empty hangers with new designer duds. I’ve recently become interested in the concept of a “capsule” wardrobe, a trend partially known as “uniforming.” The idea has been around in various forms for some time. It encourages you to dress in the clothes you like, in the colors and fabrics you prefer, and to purchase only high-quality items that support your budget and body style. It doesn’t mean that you need to wear the exact same outfit every day — although if you choose to do so, it isn’t necessarily a bad thing. After all, don’t many men wear a similar suit and tie or khaki’s and button down look daily? Creating a capsule wardrobe is a great way to streamline your life — and your budget — by encouraging you to purchase and wear only those items that make you feel good and that suit your life on a daily basis. Try these ten simple steps to achieve your perfect wardrobe! Lay the contents of your closet out, by season, in a single space. I tend to use the bedroom and the bed, because I have tiny closets. If you haven’t worn it in the past year and it’s still in good shape, put it in the ‘to donate’ pile. This includes items that don’t fit! If the item can be hemmed, let in or let out to work, put in the ‘to tailor’ pile. If the item is out of season but still regularly worn and well-fitting, make sure it is clean and in good repair, and put aside. Create a separate pile to lauder or dry clean other items. Once the items are clean, package neatly and put away – either in another closet, in storage bins, or on covered rolling racks. I personally prefer to leave the items hanging, if space permits — after all, who knows when you might have an unseasonably warm day or want a warm-weather mid-winter escape? Now, see if you spy any patterns. Do you like a certain color? Is your style preppy or classic or trendy? Do you prefer tailored fits or flowy styles? This should give you an idea of your “style.” Do you like what you see? If so, move on. If you’re stuck, consider pausing here. Many department stores offer personal shopping services to help you determine your style, and all of these are free. Prefer to shop online? Try a service like StitchFix (for women) or Trunk Club (for men) that sends clothes curated just for you to your door. Send back what you don’t like, no questions asked. Write down your preferred style – seriously. On a piece of paper. Or snap photos of the items on your smartphone. Now, look for gaps. After your closet edit, are you missing jeans, black pants, or have an abundance of cocktail dresses when your life is more of an “athleti-leisure” style? Think of what you wear on a daily basis. Now look – how much of that do you see in your closet? Your wardrobe should be about 80% of the ‘basics’ — whatever that is for you, and about 20% special occasion or ‘fun’ items. Make a list of the missing items, plus a few wishlist staples. Don’t think about budget … yet. Still have piles of clothing on the floor? It’s time for a closet cleanup. Put the items back in your closet, sorted by type and color. 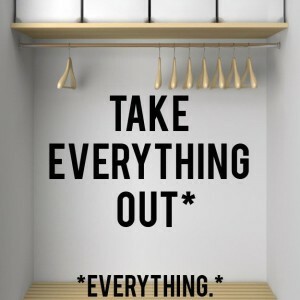 We use this as an excuse to go out and buy coordinating hangers and simple organization bins so that everything goes in neat and tidy. Be sure to buy extra hangers and bins – you still have some shopping to do! It’s time for the fun part: get inspired. Even if you identify with ‘classic’ style, look through current fashion magazines, catalogs, and your favorite retailers for inspiration. We’d suggest using a site like Pinterest to keep a “style” board of your favorite looks. Now, to shop! Or, pre-shop, that is. Between your closet ‘missing’ list, your inspiration boards, and your ‘preferred style’ sheet, you should have a pretty good idea of what it is you like — and what it is you need. Note that I haven’t yet discussed budget. That’s because money isn’t the focus of this exercise. Whether you need two items or 20, remember, there’s no rush – it’s about finding what works, and making wardrobe investments in high-quality, well-fitting items when you find them, and at a price you can afford. You can buy items now and over the next few months, prioritizing those items you’ll wear most often and those that are on sale or available at a discount in the short term. Use sites like Shopstyle.com to get an idea of what is currently available, and at what price. Before purchasing, try on a variety of items, taking note of what pieces, particularly basic staples, fit you best, and what size and brands work for your body and budget. Keep in mind that it’s not about the number on the tag, but about the fit. You can always have items tailored (often free in store) to fix length or to nip in at the waist or shoulders. Don’t hunt ‘just for the perfect jeans’ … take your time to try on a variety of items from your list, focusing on the colors, styles and fabrics you’ve identified previously. Try to hone in on the ‘gaps,’ avoiding trends and distractions. Buy only what you love. One ‘quality’ item is better than ‘it works for now’ pieces. These items may tend to be more expensive, so it’s okay to walk away with only one or two pieces each trip. Consider cost per wear. If the item is 200 but you’ll wear it weekly, that’s 200 / 52, or under $4 per wear. If it’s $20 and you just want it for Saturday night, that’s a much more expensive purchase in the long term. Evaluate each item as it relates to your current closet – that shirt is great, but if it needs shoes, a skirt and a pair of earrings to make it work, than it will sit unworn. Build your wardrobe gradually, expanding as you can to other items like shoes, bags, jewelry and even undergarments. It’s that simple! Have you tried a similar wardrobe edit? Let us know your successes (or failures) in the comments.